ICIMOD observes International Women’s Day every year by celebrating the achievements, knowledge, and agency of mountain women in the Hindu Kush-Himalayas as well as the diversity of women who work at the Centre. Each year, it invites guests, partners from regional countries, gender focal points, staff, and media to celebrate by organising events around women and gender issues from a mountain perspective. This year, ICIMOD is honoured to invite Ms Anuradha Koirala, Chairperson of Maiti Nepal and CNN Hero of the year 2010, as the Guest of Honour and Keynote Speaker for this special centennial celebration of International Women’s Day. Ms Koirala is an important role model for women from different walks of life and different age groups in the region and beyond. She is known and celebrated widely for her crusade for women and their basic human rights; as well as her commitment to improving their livelihoods. 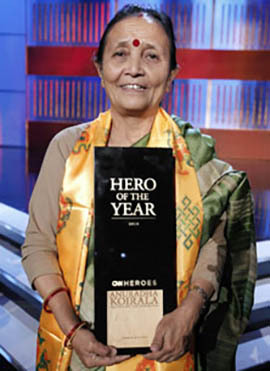 Ms Koirala, has won more than 31 national and international awards for her work on behalf of the rights of women and children. Most recently she was presented with the CNN Hero Award for 2010 at a ceremony hosted by CNN’s Anderson Cooper in Los Angeles. Her receipt of this award has brought critical issues around trafficking, which has plagued Nepal for several decades, to global attention. Ms Koirala, a former school teacher, has come a long way. A social worker by choice, she is well known and admired in Nepal. To many people she is synonymous with Maiti Nepal, an organisation she founded with fellow activists in 1993. Maiti Nepal seeks to protect vulnerable Nepali girls and women from domestic violence, trafficking, and sexual exploitation, including child prostitution, and to rehabilitate them as productive members of a society that sometimes turns its back on them. To date, Maiti Nepal has rescued over 12,000 Nepali girls and women from border areas in the south as well as brothels in the region. Ms Koirala and her Maiti Nepal team provide the girls and women rescued with a ‘home’ where they are cared for, counselled, taught to laugh and play, and provided with life and work-related skills such as farming and the production of high-value crops. These skills prove critical once they leave ‘Maiti’ to join the gender-based challenges of the real world. Maiti Nepal runs three prevention homes, nine transit homes, two hospices, and a high school. Its regular activities range from running awareness campaigns, community sensitisation, and rescue operations, to apprehending traffickers, providing legal support to the needy, running empowerment programmes, and providing anti retroviral therapy (ART) to children and women infected by HIV. The efforts and work of Maiti Nepal and ICIMOD overlap in significant ways. They both seek to promote gender equality and address gender issues related to migration, agriculture, sustainable tourism, high-value products, and women’s empowerment and development of leadership skills. Click here to visit event page for IWD 2011 Celebration at ICIMOD. "Human trafficking is a crime, a heinous crime, a shame to humanity. I ask everyone to join me to create a society free of trafficking. We need to do this for all our daughters."